From the moment when the thermometer drops below 7°C, a tyre's performance is reduced. The purpose of winter tyres is to give your vehicle the best possible grip in cold weather. 1. Why should I fit winter tyres on my car? It is recommended to fit winter tyres between November and March inclusive. This recommendation is even more important for motorist who are likely to be driving in geographical areas where winter climate conditions are harsh. It is extremely important to have winter tyres in top condition, because worn winter tyres are of no use on snowy or icy surfaces. PNEUS ONLINE advises you to fit four winter tyres (also called snow tyres), in order to maintain good road holding in winter time and recommends that you change your winter tyres when they have only 3.5 mm of tread depth remaining. 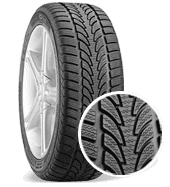 From the point where the temperature drops below 7°C , the tyre no longer has the same properties and both tyre and vehicle reactions are affected. Because of its characteristically high number of grooves, the tyre's adhesion is optimised and the braking distance at low temperatures is reduced. Winter tyres give better traction on snow and black ice, even to the heaviest vehicles (4x4s, commercial vehicles, etc.). In spite of all the technological innovations that assist with braking, traction control and other vehicle anti-skid systems (ABS, EPS, ASR, etc.) their usefulness in winter conditions can only be at its best if the vehicle is equipped with winter tyres; with summer or all -seasons tyres the performance of these systems is clearly less effective. Whatever the weather conditions (snow, black ice, rain, etc.) winter tyres allow you to drive more safely. 2. What does a winter tyre look like? A winter tyre can be distinguished from a summer tyre by the density of its rubber. Unlike with a summer tyre, the rubber on a winter tyre does not harden and therefore gives the tyre a better grip on the road at very low temperatures. Because of the greater number of grooves, the traction of a winter tyre will also be better than that of a summer tyre when driving on an icy, snowy or wet road. In addition to the higher number of grooves, a snow tyre is also equipped with deeper tread patterns on its contact surface, enabling it to shed mud and snow instantly. 3. When is the use of chains necessary? The purpose of chains is to penetrate deep into the snow layer and prevent it from accumulating on the tyre which would result in it no longer being able to propel the vehicle. Equipping your car with winter tyres can avoid having to fit chains in 99% of cases. They may only be used on snowy roads, whatever the season, and on sections of road equipped with B26 "special equipment compulsory"signs. The manufacture of snow chains has been subject to special standards since 31 March 1986. However, the use of equipment acquired before this date is permitted. Its use is not regulated. On the other hand, on sections with B26 signs, if "snow tyres permitted"is not stated, drivers must use chains. that you never drive at speeds above 25 k.p.h. with chains fitted. Remove chains when there is no snow on the road at the risk of damaging both the wheel (tyre, rim) and the vehicle itself (wheel arches, bodywork, etc.). There is an alternative to the classic steel chain: the textile chain, recommended as ideal for narrow wheel arches.